Many scientifically-minded people claim that mankind does not have free will. Instead, they say that all of our choices are determined by physical laws, and our perception of free will is an illusion. I hope to show that this claim is either false, or if it’s true then we can’t know it, because it is self-refuting. This is a compelling argument. It reminds me of Star Trek’s transporter: a person’s atoms are beamed across vast distances, and when they rematerialize, they are still the same person as before. If my atoms were converted into the atoms of another person, I’d be that person. A problem with using this story as an argument for determinism is that it begs the question. It assumes determinism: that given the same person, atoms, and point in time, we will always make the same choice. Free will says we could choose differently, even given all the same preconditions. Also, it’s not a scientific argument, though it is made by a scientist. It cannot be tested nor falsified. It is simply impossible to go back in time, become someone else’s atoms, and see what would happen. Therefore, it fails the scientist’s own criteria for determining whether a claim is true. First, I do believe that thoughts arise in our minds without our control. Sometimes I have thoughts I’d be embarrassed to share, other thoughts I’m proud of, and most other thoughts are unremarkable. The key experience we have is that we can decide what to do with our thoughts. If the thought is a lie (you can’t do it), we can choose to remember the truth (yes, you can). I go so far as to say that our raw thoughts are not who we are. Instead, the thoughts we choose become our identity. The Bible talks a lot about renewing our minds (Romans 12:2), or taking thoughts captive (1 Cor 10:5). I’ve experienced the reality that thoughts can be captured and redirected from negative to positive. Sometimes it’s difficult, but it’s definitely doable. We know we have that freedom when we choose to use it. You may be experiencing this now: you’re reading, considering my thoughts, having thoughts of your own, and then something else, your will, is deciding whether or not you understand, agree, or care. I think this distinction between our thoughts and our “self,” our choosing, deciding, intentional, willful self, is the key difference. Look back over the past year to a decision you now believe was a mistake. (20-20 hindsight, anyone?) Do you believe that you could have chosen differently? Most people I ask say: “yes.” Is that sense an illusion? Well, as in Dr. Harris’ psychopath story above, we can’t go back in time and test this hypothesis scientifically. However, I find lived experience to be compelling evidence. When I think back to a foolish purchase, for example, I remember a voice of wisdom inside that I chose to ignore. Dr. Harris is right when he says on page 61 that, in many ways, people who make good choices that lead to great outcomes are “lucky” (I’d say blessed instead). They may have been born into a wealthy, free country to great parents who were generous and kind. They and their family may enjoy good health. They may not have a predisposition to alcoholism or gambling that makes them vulnerable. Any number of environmental factors may limit our available choices, just like a blind person can’t just choose to see. However, none of these constraints invalidate the truth that most healthy people have the ability to evaluate options and make decisions using what we call free will. My friend Luke Stokes recommended another book to consider: Thinking Fast and Slow by Nobel laureate and psychologist Daniel Kahneman. In a compelling parade of psychological studies, Dr. Kahneman shows the many ways people can be biased, led astray, confused, and inspired to accept false ideas. TF&S is sometimes used to show that our perception of free will is illusory. Time and again, Dr. Kahneman and his colleagues were able to manipulate people’s thinking in predictable ways. For example, studies showed that people can be “primed” by presenting them with certain words that impact their behavior in ways the subjects did not expect. Kahneman’s book is a great compilation of ways that we can be deceived and not know it. While reading TF&S I regularly felt humbled and challenged, and questioned my own ability to reason. Rightly so: I definitely believe I need constant refinement and improvement, and I have the same potential to be unaware of my biases as anyone else. These claims are all quite bold, and they resonate with us. If I describe a delicious smoothie with peanut butter, chocolate, bananas, and blueberries and you buy a smoothie after reading this article, are you, for that reason, not free? Kahneman doesn’t necessarily go that far, but his whole book essentially “primes” the reader to lose confidence in his ability to make reasonable, free decisions at all. It’s not that Kahneman’s studies aren’t valid; they certainly show many examples of people under the influence of unconscious biases. The question is: what do these studies prove? Do they prove people have no free will? If so, how can the scientists themselves even study? Would they not likewise be so biased that they could draw no reasonable conclusions, refuting their own ability to make claims? Or, is it just that we can be influenced, maybe even programmed, and we must choose to become be careful and aware of how susceptible we are to the input all around us? We experience ourselves as individuals with free will. You know that you decided to keep reading this and that you could bail out at any time (thanks for staying!). You may be hungry, and you know you can decide to eat now or wait, what to eat, and how to pay for your meal. In countless ways, we experience the world as free agents. Can I be influenced? Absolutely! Can I be deceived and make decisions from bad information? No doubt. Can pain in my past make me resistant to taking reasonable risks in the future? Sure. I even think that our consciences can be “seared as with a hot iron” so that after a pattern or habit of bad choices we can be so stuck in our ways that change is nearly impossible, apart from a major intervention. None of these limitations remove the real experience, however limited, of freedom, responsibility, and ultimately, of personal identity. I created this flowchart to show what I mean. When deciding whether or not we have free will, we have to consider the options. (For this example, I’m simplifying this broad subject to “yes” or “no”; I realize there are many nuances.) We then evaluate each option in light of a reasonable process: we consider our empirical experience, we read competing theories, we talk with people, we think things through. We may even run it through our filter of values too: are we trying to be objective or just win an argument? Are we afraid of the outcome of one choice or another? 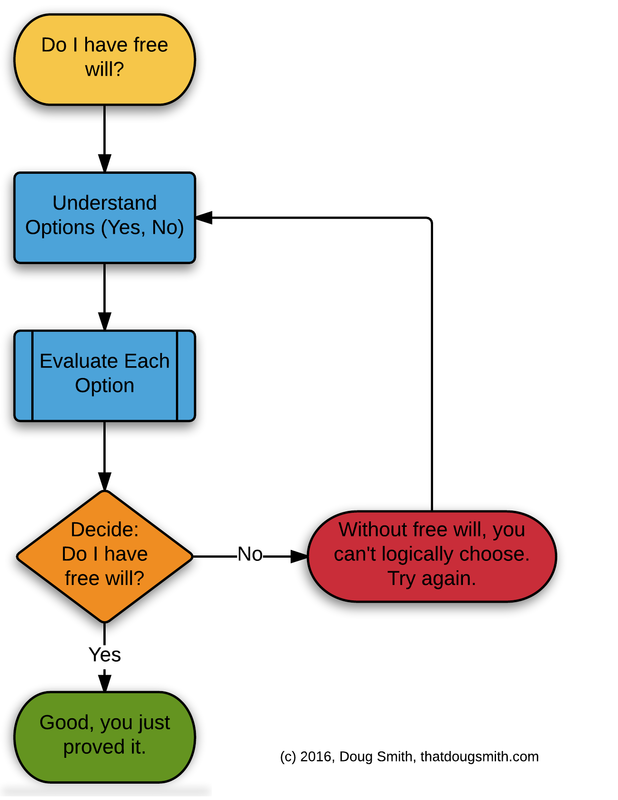 Following the evaluation of options, we are left with a decision: do I have free will? Now, if I do have free will, I actually have the capacity to choose the best option. I have within me the ability to evaluate in light of what I believe, perceive, and value. I then can decide: yes, I have free will. However, if I don’t actually have free will, my ability to make a free choice in response to this question is an illusion. I think it’s even worse for determinists who follow a materialist evolutionary line of thought. If the way our minds work is just a byproduct of natural selection acting on random mutations, then the goal for which our minds were made was simply to survive and reproduce, not to be reasonable, rational, or logical. This is even more self-refuting, because our very idea of rationality would be an illusion, and minds with arguments suitable to survive and procreate would be selected, not minds with arguments that are actually true. In light of these considerations, I claim that our experience of free will is real, even if constrained in ways we’ve discussed. In addition, even if determinism were true, we could not know it, because we would lack the very freedom required to prove its absence. The question of whether we have free will has very important implications for ethics, morality, and even theological systems. In the end, the way we live our lives on a daily basis is shaped by how we answer the question of whether we have free will. I choose to live my life in light of my experience of reality: I am free, and am responsible to use that freedom to make the wisest, most positive choices possible. How do you work out these age-old questions? Do they matter to you? Next: Next post: Study shows Free Will is an Illusion. Really? Great article, Doug! I really enjoyed it, and it gave me a lot of think about. Great write up, Doug! I really enjoyed it. I also agree the way we view free will has very important implications for how we live our lives. Take, for example, our concept of justice. If, at some point in the future, we could experience enough of someone else’s life experiences (say, through a direct brain connection) along wth a set of filters which might cause our brain to react to input in the same way as their brain does on a chemical/electrical level, would we be so quick to support things like the death penalty? Would we try to punish criminal behavior instead of trying to rehabilitate a brain which is detrimental to a healthy society and individual? Some interesting things to consider, for sure. I added some more thoughts below to keep the conversation going. Free will says we could choose differently, even given all the same preconditions. But this is also a claim which would require some evidence, right? What evidence do we have to think something outside of the brain (other than the sense data, which, in this example, would be exactly the same) influences our decision making process? On the contrary, if we study specific damaged areas of the brain, we see direct evidence of how those areas in the brain impact that process. Same goes for when we excite specific areas with electricity. It cannot be tested nor falsified. Yes, the complete example of “being someone else” can’t be tested, but the claims about the physical brain being the source of the decision making process can be, to some degree. I also think, within our lifetimes, we might create simulations which could really inform us about this whole process. As an example: someone obtains a digital processor which records every single electrical signal received by the brain since birth. We then simulate those same experiences through a genetically similar digital brain with a synthetic consciousness and see what happens. This may sound like crazy science fiction to most people, but the more I follow people like Ray Kurzweil (who has an amazing accuracy rate on his predictions going back multiple decades), some of what I described may be possible as early as 2045. And we do that through… thoughts, right? But did we choose? Was this just another response on the weighted neural network given all the current inputs? Would they not likewise be so biased that they could draw no reasonable conclusions, refuting their own ability to make claims? I’m confused how you came to this conclusion. If the scientists were predisposed due to their genetic makeup, life experiences, etc to follow the path of science and the scientific method, then couldn’t we argue they are just “running a program” in a sense? Also, worth noting, when we know about things like priming, anchoring, etc, they have less impact on us. The “System 1” / “System 2” language for describing the various ways our brain function, I think, is very helpful. What you call “free will” might also be called “System 2” within this framework (though the author clearly goes a bit further, describing how easy it is to fool System 2 because it relies on System 1). In countless ways, we experience the world as free agents. Or we’ve created language to describe our experience of the world in terms of free will and agency. None of these limitations remove the real experience, however limited, of freedom, responsibility, and ultimately, of personal identity. our very reasoning processes depend on our ability to freely choose between options. This gets into the foundation of logic, reason, math, etc and the nature of truth claims and epistemology itself. For me, to deny these mechanisms we’ve created is to give more credence to hard solipsism which, I’d argue, is useless. Even if we are brains in a vat, as an example, operating as if we are not is more reasonable (give the current evidence) than assuming we are. Now, if I do have free will, I actually have the capacity to choose the best option. I have within me the ability to evaluate in light of what I believe, perceive, and value. I then can decide: yes, I have free will. With this perspective, couldn’t you just as easily say, “Well, I believe in the definition of whole numbers and in the mechanism of addition, therefore I decide that 2+2 is indeed 4.” Was that a choice or a deterministic process, given the data? I’d argue, given accurate data and definitions, the answer always has to be the same and there is no room for subjectivity or choice. the goal for which our minds were made was simply to survive and reproduce, not to be reasonable, rational, or logical. This is a scary thought for many people. It can lead to nihilism as well. I’ve come to embrace it and see what lies beyond. This is even more self-refuting, because our very idea of rationality would be an illusion, and minds with arguments suitable to survive and procreate would be selected, not minds with arguments that are actually true. Indeed. And what if this, in fact, the case? What if even our experience of reality is based on selected interpretations, not on a “real” understanding of what makes up the universe? How would that change what we understand to be “true” or our epistemology frameworks? This is why I’m such a fan of the scientific method because it gives us a way to continually re-evaluate our assumptions in light of new empirical evidence. Thanks Doug. I hope my responses are interesting for you. Great write up, Doug! I really enjoyed it. Thank you, Luke! I appreciate you taking the time to read it and provide such thoughtful responses! This is very important, and I agree that the world needs many criminal justice reforms. Even under free will, there needs to be more emphasis on being truly helpful to everyone involved in a crime (victim and perpetrator), even grace-filled, working to rehabilitate as much as reasonable and possible. Determinism need not be the motive of these needed changes. What evidence do we have to think something outside of the brain … influences our decision making process? We don’t necessarily need something outside the brain. Free will doesn’t require something like body/soul dualism. I tend to be more of a physicalist in my understanding of mind/brain; influenced, I’m sure, by decades of developing software. It’s easy to think about a software system engineered for consciousness and free will, running on the hardware of the brain. And we do (decide what to do with our thoughts) with thoughts, right? Well, I make a distinction between thoughts that are propositions: “that is green, it’s hot outside,” thoughts that are desires: “I’m hungry, I need a smoothie,” and thoughts that Finney called “executive actions”: “I’m standing up now and going to the refrigerator.” Our free choices are informed by propositions and desires, but the point at which we choose, that experience of execution of an action, is different than the others. One way we know this is through experience: both subjective and observational. I think I could have worded that more clearly. My point was that if our thoughts/choices/actions are determined, all the way back, then whether someone is “following the path of science and the scientific method” cannot even be evaluated. The ability to weigh options and freely choose between them allows a scientist to see whether she is following the scientific method. The Free Will Theorem posted by Kevin seems to say that the very fact a scientist can choose what to measure in an experiment demonstrates that they have free will. This gets into the foundation of logic, reason, math, etc and the nature of truth claims and epistemology itself. … With this perspective, couldn’t you just as easily say, “Well, I believe in the definition of whole numbers and in the mechanism of addition, therefore I decide that 2+2 is indeed 4.” Was that a choice or a deterministic process, given the data? I’d argue, given accurate data and definitions, the answer always has to be the same and there is no room for subjectivity or choice. This is good, Luke; I think you boiled it down very well. How do we come to know 2+2=4? It happens so early for most of us that we can’t remember not knowing it. It’s not just that we “believe” or adopt the proposition that the formula is accurate. We know 2+2=4. I think we come to know that through a process articulated by Michael Polanyi, who I am just beginning to learn about. It begins with someone we trust, who shows us how to count: we understand what two things are, and then what four things are. Our trusted teacher then shows us what happens when we take two things, combine those two with two more, and helps us count the result. We experience knowing, by choosing to walk through this process. We are able to say: I, myself, know this is true. Once the concept is explained and we experience it, we embrace it (through choice) and then it becomes ours. All along the way, we learn definitions (“one, two, three…”). We then compare the definitions with what we have learned, so that if, after we know these timeless mathematical axioms such as how to count and combine, someone tries to tell us that 2+3=4, we evaluate that, compare it with what we know, and decide that they are wrong. So you’re right, the answer is always the same given “accurate data and definitions”, but we choose to engage in the learning process, we choose to understand and participate, and we continue to choose to weigh competing theories in light of what we know. So I argue: free will is required for all true learning, where we come to know whether something is right or true. And what if this [that rationality is an illusion because minds are selected for survival, not rationality], in fact, the case? What if even our experience of reality is based on selected interpretations, not on a “real” understanding of what makes up the universe? How would that change what we understand to be “true” or our epistemology frameworks? This is why I’m such a fan of the scientific method because it gives us a way to continually re-evaluate our assumptions in light of new empirical evidence. This really goes to the heart of what I tried to share in this article. I don’t see how one can justify their use of the scientific method when they have no basis from which to believe they are using it correctly. We experience ourselves as being able to make rational choices and evaluate things according to the scientific method. But at the same time, it seems like you are saying that the conclusions of your application of the scientific method actually lead you to undermine that very scientific method. How is this not sawing off the branch you’re sitting on? Thanks again, Luke! I so enjoy dialog with you because you are positive, articulate, very bright, and always challenge me without the condescension and ridicule that others who share your views often bring. Determinism need not be the motive of these needed changes. No, but I think it can be a strong motivation for a “grace-filled” attitude towards others. If at some point in the future we’re able to prove determinism, those pushing to punish others will sure have a lot of explaining to do. Interesting point about free will not requiring body/soul dualism. I like the analogy about computers but where it breaks down for me is that even the hardware, in a sense, is also built from software. Assembly code is imprinted on the chips. I can see why this would be an argument for design, but I think that’s a bit of selection bias in that the way we designed computers (potentially) mimics what actually works and has worked for millions of years of evolution. What we consider “designed” could also come about via natural selection over a long period time, even if we (incorrectly) call that “designed”, but that’s a much larger discussion which I know you’ve already responded to in other blog posts. Well, I make a distinction between thoughts that are propositions…thoughts that are desires…and “executive actions” …One way we know this is through experience: both subjective and observational. Huh. Interesting. I don’t think I’ve seen the need to make those distinctions beyond what has been called System 1 and System 2 thinking. I think Thinking, Fast and Slow does a good job of explaining how what we might consider an “executive action” controlled by System 2 is actually being massively informed by System 1. I liked the Free Will Theorem (thanks Kevin!). I’m not sure if it has a bit of begging the question in it though. Also, if the outcome doesn’t matter (i.e. it’s a 50/50 weighted node on a neural network), is that really free will? If I measure X or Y, is that really a choice or just a “random” solution to an internal brain request of “give me something to measure, it doesn’t matter which one”? I have a hunch we’ll find something close to a random number generator in the human brain, much like we’ve come to need in our own computer programs. Again, I don’t see this as evidence for design as much as evidence for systems that work within this 3 dimensional universe which we stumbled upon quickly thanks to our brains and nature stumbled upon via much trial and error. I really like aspects of the “All Knowing Is Personal” idea from Michael Polanyi, though I also agree with Turing. I think we’ll eventually understand how the brain works well enough to pinpoint how that personal knowing comes about, but I do like the idea that we determine our understanding of reality via our experience with it. There are parts I don’t agree with, but I at least like the attempt to make “knowing” a more human experience. You say we “choose to engage in the learning process” but couldn’t that also be a deterministic response? Couldn’t some engage while others do not, purely based on their genetics, their environment, their experiences, and their upbringing? It might be more accurate to say, “Some are more rewarded by the learning process than others” which, to me, brings it back into the language of a neural network which is just firing off nodes based on weighted values. I don’t see how one can justify their use of the scientific method when they have no basis from which to believe they are using it correctly. I don’t see it this way because the results of use either lead to beneficial things or they do not. We either understand reality enough to fly to the moon and build better buildings and agriculture, etc or we do not. Can you help me understand this statement more? To me, a good application of the scientific method brings a better understanding of physical reality which, by definition, relates to some aspect of truth. Truth, from a mathematical/physics/chemistry/engineering perspective leads to more predictable outcomes and when our goal is to increase human well-being, as an example, those discovered truths are very useful. No, but I think [determinism] can be a strong motivation for a “grace-filled” attitude towards others. I find the idea that determinism “can be a strong motivation” to be quite ironic, almost proving my point! 🙂 Motives are such an important part of intentionality, and therefore, free choice. All kids say “I didn’t mean to,” knowing that if they intended to do something it means more than if it was an accident. One’s spouse feels much more loved when we are motivated do something special for them as a surprise instead of because we “had to” or were “forced” by a holiday or something … determined. If at some point in the future we’re able to prove determinism, those pushing to punish others will sure have a lot of explaining to do. The idea of trying to prove determinism speaks towards my original point: I don’t think you can prove anything if we are determined. If our choices are determined, we would not have the ability to make the independent evaluation of reality required to know it. seems like a “genetic” or “poisoning the well” fallacy, and it certainly does not follow from acceptance of free will. I find free will, including the idea that we are responsible for our actions, to be much more hopeful, beneficial, and in the end, loving, than determinism. First, because it accepts reality as we experience it, and second, because people can rise above their more base/animal urges and choose to become better, altruistic, faithful, and self-sacrificial. I like the analogy about computers but where it breaks down for me is that even the hardware, in a sense, is also built from software. Assembly code is imprinted on the chips. I can see why this would be an argument for design, but I think that’s a bit of selection bias in that the way we designed computers (potentially) mimics what actually works and has worked for millions of years of evolution. I’ll see your selection bias and raise you a false cause fallacy. 😉 However, as tempting as it is, I won’t take us off any further into the design debate here because it is such a huge topic and other people are probably already lost in these comments. I think Thinking, Fast and Slow does a good job of explaining how what we might consider an “executive action” controlled by System 2 is actually being massively informed by System 1. Yes, TF&S does provide many of examples of how our “executive actions” can be influenced through the System 1/2 model. However, I was attempting to differentiate between kind of involuntary thoughts that don’t seem to be in the scope of Kahneman’s System 1/2 model from the intentional part our minds that Kahneman does focus on. Do you not experience a distinction between the perception that you’re reading right now, that the background is white, or that your phone has a certain battery level, from the choice to continue reading? That’s the distinction I’m trying to make, however feebly. I’m not sure if it has a bit of begging the question in it though. Also, if the outcome doesn’t matter (i.e. it’s a 50/50 weighted node on a neural network), is that really free will? If I measure X or Y, is that really a choice or just a “random” solution to an internal brain request of “give me something to measure, it doesn’t matter which one”? That would be a deterministic way to look at this, but it seems speculative to me, since we don’t know that there is any such system in the brain. It’s a possible model, but it assumes determinism. Without an actual functional understanding of the brain at the same level we understand computers, it may be that any attempts at a scientific proof of free will or determinism have question-begging and speculative aspects. That’s probably why philosophers and scientists have struggled with this for millennia. In the end, I am appealing to experience and logic to point me to accept the reality of free will (something, by the way, that even many of my Christian friends deny). We experience ourselves as having free will, and again, I think that if we do not have free will, our attempt to prove it is determined and therefore invalid. I think accepting something as true based on speculating on what we may learn in the future is less helpful than accepting something as true based on our best understanding and experience of present reality. We can point to examples of learning based on necessity with no trusted individual around, but I mainly dislike it because so much authoritarian thinking and appeal to authority comes from this framework which justifies the need for those positions of authority. The fact that there are authoritarians and illogical appeals to authority no more invalidates Polanyi’s point than the presence of McDonald’s restaurants invalidates the existence of healthy food. There is learning based on necessity, like touching a hot stove, but that’s different than most higher learning. The point is that since it is absolutely impossible for us to personally prove everything ourselves by studying every field of knowledge experientially, the vast majority of our learning comes from trusted teachers who show us the way. You say we “choose to engage in the learning process” but couldn’t that also be a deterministic response? Couldn’t some engage while others do not, purely based on their genetics, their environment, their experiences, and their upbringing? I’m certainly not saying that we aren’t influenced by all of those factors, we absolutely are. But not ultimately, in my view. There are far too many cases of people overcoming all of those factors, against all odds, to overcome and succeed. They are the underdog stories we love to hear, as they inspire us to rise above and overcome challenges that might otherwise limit us. The difference they claim? Grit, perseverance, intentionality, fortitude, character. All qualities I associate with free will. I want to tell the world: “You can do it!” not, “You have no choice.” My experience is: people can choose to change, for better or worse, and overcome tremendous genetic and environmental factors to become more than anyone could ever predict. I don’t see [determinism undermining the scientific method] because the results of use either lead to beneficial things or they do not. We either understand reality enough to fly to the moon and build better buildings and agriculture, etc or we do not. You’re right: in the case of engineering or architecture, we can typically take a pragmatic approach to knowing whether our method is working. However, many other truths don’t seem to work that way. Political systems can be said to be “working” by those in power, who claim their ways are best because of the things they choose to measure. The leading scientific theories are often similar: not chosen because they are ultimately true, but because those who lead the most powerful institutions filter ideas that they don’t agree with. Religious institutions have certainly been guilty of this over the millennia too. Like you, I think truth is ultimately the best for everyone, regardless of whether people feel better knowing it in the short term. Can you help me understand this statement [where I said “it seems like you are saying that the conclusions of your application of the scientific method actually lead you to undermine that very scientific method”] more? To me, a good application of the scientific method brings a better understanding of physical reality which, by definition, relates to some aspect of truth. Truth, from a mathematical/physics/chemistry/engineering perspective leads to more predictable outcomes and when our goal is to increase human well-being, as an example, those discovered truths are very useful. Yes: what I’m trying to say is that if rationality, along with free will, are illusions, as you claim, then it seems impossible for us to know that we are accurately applying the scientific method. The scientific method requires rational, free agents to apply it. In order to make an observation, propose a hypothesis, test that hypothesis, then especially, determine whether that hypothesis is objectively false, one must have the ability to rationally evaluate and choose the best results. By denying the prerequisites of applying the scientific method, I don’t see how you can say you’re applying it at all. Thanks again, Luke! I hope this has been as helpful for our readers as it has been for me. Great article, Doug. I look forward to reading your posts here! The silly thing about determinism is that you can’t prove a determinist wrong because it’s ultimately unfalsifiable (and therefore meaningless). The other absurd thing about determinism is that anyone who believes that determinism has a scientific backing must have stopped studying physics in the 19th century. Due to quantum mechanical revelations such as the Heisenberg uncertainty principle, certain physical facts are unknowable. If you want to dive deep into this, there’s an absolutely fascinating lecture series by a Princeton math professor Dr. John Conway where he presents his free will theorem. It gets pretty technical, and it’s been a few years since I’ve watched the videos, but I remember being blown away. Hey Kevin! Thank you for reading and your comment! I’ll look forward to seeing Dr. Conway’s presentation, it sounds very interesting! Can software have reasons? Can deterministic systems have reasons? I don’t see motivation as requiring choice, but I see how you can equate it to intentionality and free choice, but that was not my intention when using the word. As for spouses feeling loved, couldn’t that also be a way in which we trick ourselves? If we want them to feel that way, don’t we (as loving spouses) “have to” surprise them? If our choices are determined, we would not have the ability to make the independent evaluation of reality required to know it. I think you’re looking for hard, big T, absolute “Truth.” Science doesn’t really work that way. Deterministic algorithms in computers give us answers all the time which meet our needs well enough to be considered valuable (granted, by our own flawed determination of value given our current state of information). The beauty in the scientific approach is it’s always (or should always be) open to modification given new input and new goals. people can rise above their more base/animal urges and choose to become better, altruistic, faithful, and self-sacrificial. I also think people can do these things, but not through vague ‘try harder’ or ‘make better decisions’ processes. I think they are deterministic processes driven by our genetics, our environment, the results of our previous decisions, and any new input (i.e. education). Do you not experience a distinction between the perception that you’re reading right now, that the background is white, or that your phone has a certain battery level, from the choice to continue reading? That’s the distinction I’m trying to make, however feebly. I see those ideas as falling into his model of the brain just fine. Perceiving properties of objects in reality is a lot of hardwired, System 1 stuff and making a “decision” (for lack of a better word) about what to do in the next moment with our time is informed by that input data and the state or our brain in that moment. If it’s not based on the state of our brain in that moment, then wouldn’t we have to argue for some kind of dualism and say something outside of our physical brain influenced us in some way? It’s a possible model, but it assumes determinism. Yes, that’s a fair criticism. Much of everything else I see in nature and life comes from deterministic processes of cause and effect (I get thirsty so I drink, I get hungry so I eat, I get tired so I rest, etc). It’s hard for me to imagine certain levels of consciousness somehow break this mold instead of just imagining the system to be so complex we can’t yet explain it in simple terms like we can for basic, low-consciousness life forms. have question-begging and speculative aspects. That’s probably why philosophers and scientists have struggled with this for millennia. But I see nature as a complex interaction of deterministic, cause and effect processes. To argue that changes as soon as the level of consciousness reaches a certain level is a confusing jump for me and would need some justification other than us wanting to believe we’re somehow unique or special in some way. the vast majority of our learning comes from trusted teachers who show us the way. As someone who was homeschooled, I guess I see this different. Human minds are really flawed in areas like memory, eye witness testimony, and the like. I see reason, logic, the scientific method, reproducibility, and the like as ways to get around these weaknesses. Grit, perseverance, intentionality, fortitude, character. All qualities I associate with free will. Some studies would argue our genetics and environment have a lot more to do with those concepts than free will, but as you say, we can’t “prove that” just yet (if ever). I actually agree with you here in as far as we can “choose” what inputs to put into our deterministic brains which then impacts how it will respond to the next input. When we’re at a point of “Huh, what do I want to do right now? I don’t really care either way.” then we have an opportunity to add new input (because it’s, in my view, essentially a 50/50 type decision with no strong weight leaning one way or the other in the neural network). To me, that sounds like scientists “choose” an answer instead of the answer being determined by the experiment results. I see it as another deterministic process. An algorithm runs, finds the best set of hypotheses given the goal, finds or uses previous experience to create the best experiments, and then runs them to evaluate the data. I can imagine a deterministic program being designed (or evolving through machine learning) to do this also (maybe even better than us), so I don’t see the need for choice here. I should also clarify, I’m not as much of a hard determinists as I may appear here. I’m pushing back on various points and ideas because it helps me better understand my current thinking, but I’m also trying to stay open to different ideas and perspectives. Maybe there is a “free will” mechanism in the brain which breaks all understanding of materialistic hard determinism and someday we’ll understand it. I presume perfect determinism and I find free will to be perfectly compatible with it. Determinism is a belief in the reliability of causes and their effects. All of our freedoms, to actually do anything, require the ability to reliably cause effects. So determinism is a pre-requisite to free will, because without it we could never implement any intent (our will). Our deterministic universe has inevitably produced living organisms. The behavior of these organisms cannot be predicted by physics. Physics may be able to explain why the apple fell from the tree. But it cannot explain how the apple turned up in Johnny’s lunchbox 200 miles away. Physics is about the behavior of inanimate objects. To understand and predict the behavior of animate life, you need to switch to the life and social sciences, from biology to politics. Science suggests that all living things have a purpose: to survive, to thrive, and to reproduce. We observe all life forms doing this in their own way. A tree sends roots into the ground for water and pushes leaves on braches toward the Sun. A lioness brings down the buffalo to feed her cubs. Bees build hives, termites build mounds, and people build cities. Those life forms with sufficiently evolved neurology can imagine different ways to satisfy their needs and the desires that directly or indirectly arise from them. They learn the consequences of choosing one means versus another means of meeting their needs. And from these choices come ethics. And from the love they have for each other as well as their selves comes morality. Determinism is not about materialism. It is about the physical universe behaving in a rational and reliable fashion. Objects don’t erratically pop into and out of existence. Gravity doesn’t randomly change from pulling to pushing. Anything that behaves according to purpose and reasons is thus deterministic, because purpose and reason are also causes. Free will is when someone decides for themselves, according to their own purpose, and their own reasons, what they WILL do, FREE of coercion or other undue influence. Within the physical universe, the purpose of a given living organism resides uniquely within that organism, its society, and its species. It is a purposeful causal agent. We empirically observe a woman sitting at a table in a restaurant, reading the menu. After a while, she calls the waiter over and gives him her order. No one else is sitting at the table. Nor are there any prior causes sitting at the table, other than those which she has already incorporated into her own beliefs and values regarding her diet, and which are now a part of who she is. It is authentically she, herself, who has made the choice, for her own purpose and her own reasons, free of any coercion or undue influence that would subjugate her will to that of someone else. We call these events instances of “choosing of one’s own free will”.